Social Selling is not a new concept. However, the platforms used to conduct it have, more recently, been percolating their way through all aspects of society and, as such, Social Selling – or the art of developing one-to-one relationships at scale with your customers – is now seemingly endemic throughout the business world. John, tell me about you and your role. I’ve been at SAP for just under four years. I’m based in the USA and work as a client partner, sometimes also called a Services Account Manager. I work with existing customers, helping them understand the SAP organisation and what it can do for them. I help to educate customers on our latest products and services, giving them the benefit of my expertise to help with their challenges. How has the role of sales changed over the years? People no longer like being sold to. They have become more informed and aware and they use social media to learn and educate themselves. I think, as a sales person, we can no longer go out with an intention, instead we need to build relationships, learn about our customers’ businesses and establish whether there’s a true fit. Everything is based on trust now. How does sales have to adapt to this new way of buying? Salespeople now need to understand more about who they are potentially dealing with and what their challenges are. It’s important to find a ‘talk track’ that drives conversation - the sales process will then follow. You also need to build relationships across all elements of a business, not necessarily only with your primary decision maker. You need to be talking with HR and Marketing too because in the IT industry, IT aren’t necessarily making investment decisions. I’ve learnt a lot by staying on top of what’s going on. LinkedIn is my tool of choice. I read LinkedIn Pulse and use LinkedIn Sales Navigator. It gives me an insight into what’s going on in my customers’ minds; how I can drive the conversation. It also provides a great opportunity to discover new people and learn about their business. I am always looking for moments to establish a rapport with people. It’s much better than using the telephone, you get more of an opportunity to make an impression. 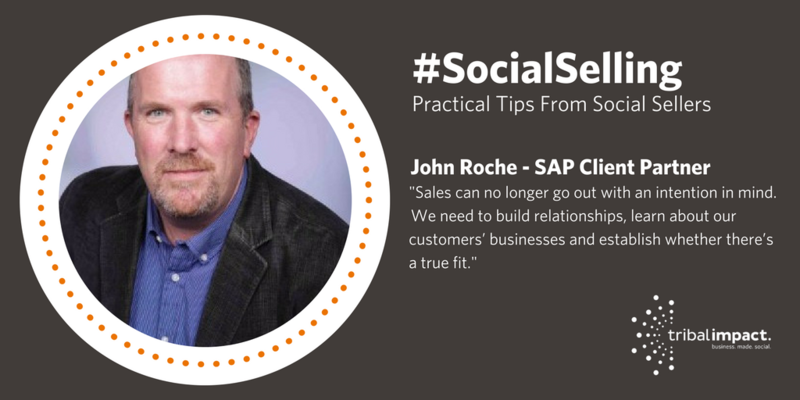 Social Selling as a term is a little misleading: it isn’t selling, it’s relationship building. It’s about using tools to learn more about those you wish to engage with. It’s kind of like building a pipeline in a relationship world and it’s definitely something that happens over time. My day starts with LinkedIn. I check out who’s posting, look at profiles, check feeds, read articles and generally try to stay ahead of my area of expertise. I get a daily update from LinkedIn Sales Navigator with a summary of updates and I find this really useful because I can focus my time. The results of my intelligence gathering to build my networks within existing customers. I might drop people an InMail to suggest coffee and a catch up if I happen to be visiting someone else at their office. I find this approach to be less intrusive and people respond better to InMail than email. What would you say to someone starting out with Social Selling? I don’t think everyone in sales will adapt to this approach and that’s ok. Some sales people don’t get it but they are still successful. In my experience, there’s room for different approaches. My advice would be to list your accounts and follow them on social media. Sales Navigator on LinkedIn allows you to do this easily. Then, start profiling a couple of your prospects and dig deeper into what they care about, their interests and what they read and take notice of. Thanks for taking the time to talk to me John - let me know if you'd like to be interviewed as part of this series.